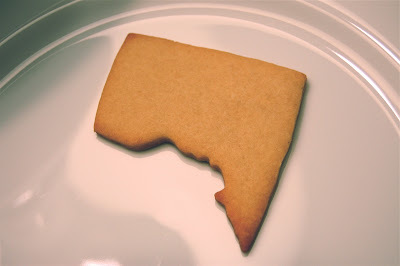 That, my friends, is a sugar cookie in the shape of our fair city, the District of Columbia. The cookie cutter that made this masterpiece possible came from Capitol Hill's fabulous kitchen store Hill's Kitchen. The shop carries cookie cutters in the shapes of all 50 states. Now, I fully meant to write about this in enough time for the really motivated bakers out there to make a complete cookie electoral map for the election. I was picturing red and blue icing, the whole nine yards. But I didn't get around to it in time. Which is no excuse when it comes to voting ... so go! Vote! Then bake cookies. SUCH a great idea! If only I had thought of this earlier... Definitely will keep the electoral, red/blue iced cookies in mind for the next election, and I KNOW that Hill's Kitchen will be around in 4 years.